Detraining rapidly exerts its harmful effects on the footballer ordered to rest after trauma. Fortunately, in the early days, a muscle building program, stretching, cardio and even viewing associate with dietary monitoring to maintain his fitness. Energy expenditure and retention of muscle mass prevents fat gain. The pursuit of workouts tailored close to the group allows the addict sports movement to keep morale. In case of prolonged absence, the injury period may even constitute a real opportunity to undertake a full athletic preparation and structured remotely turbulence calendar. Far from harming the healing, biomechanical stresses applied to the injured area contribute 'mechanization' of injured tissue. 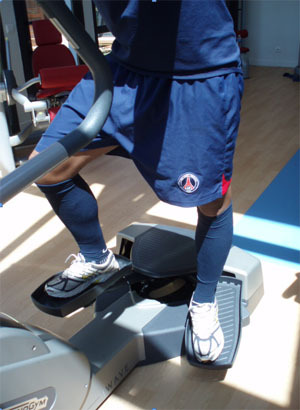 The selection of cardio machines allows to separate the physiological stress of biomechanical constraints. At the same session, the least traumatic simulators will be used to work the most intense energy metabolisms while others help to revive gradually with more gestural specificity. And to increase gradually the load of the lower limb, the following progress can be designed: swimming with and without pull-boy, water aerobics, cycling arm recumbent bike sitting, bike dancer éllipteur, stepper and running . Some key sessions take place in these protocols. sessions at the "anaerobic threshold" are a good example. They bring together the work of a key physiological point for the performance and the average intensity cardiovascular recovered in the first half. In seeking to maximize the recycling of lactic acid to a pH stabilized, the fight against bone loss by release of calcium bicarbonate. Thus, cycling, paddling balanced by the saddle, they probably contribute to the management of pubic pain. back sessions in the field follow the articular stabilization work began in physiotherapy. They allow the physiological sharpening and restore the necessary coordination to complete technical movement. It is nature that imposes deadlines for healing! Sentenced to the impossible "save time ... without harm to health," the sports physician has only one solution: give back to coaching a player great! Doctor Stéphane CASCUA. - 22 février 2010.